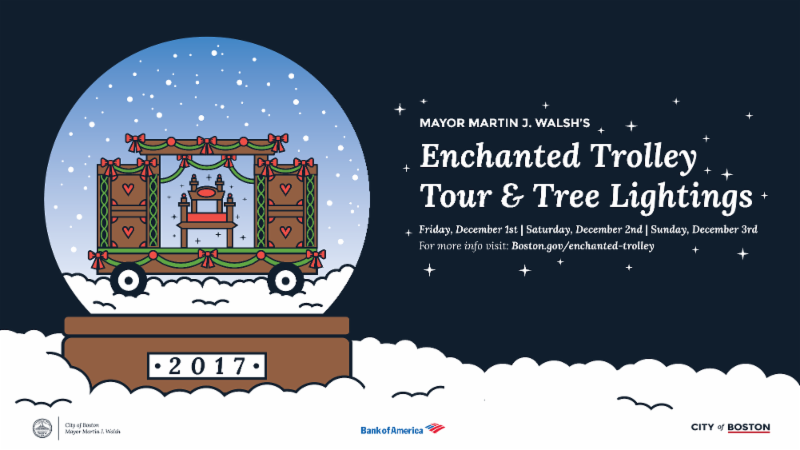 BOSTON - Friday, November 3, 2017 - Mayor Martin J. Walsh today announced the schedule for the 2017 Enchanted Trolley Tour, a Boston holiday tradition of lighting holiday trees throughout the City. This year, the Mayor's Enchanted Trolley Tour will take place on Friday, December 1; Saturday, December 2; and Sunday, December 3, in neighborhoods throughout Boston. "Our holiday trolley tour and tree lightings provide some of the best family memories of the year, building community spirit throughout Boston and bringing a little extra joy to residents during the holiday season," said Mayor Walsh. "The holiday season is a time for friends, family and neighbors to come together and celebrate, and I welcome all to attend this weekend of inclusive, family-friendly fun." "Bank of America is proud to continue our support of Mayor Walsh's Enchanted Trolley Tour, a long standing tradition that brings joy and excitement to neighborhoods and families across the City," said Miceal Chamberlain, Bank of America Massachusetts President. "We thank the City of Boston for the opportunity to help kick off the holiday season and make our communities stronger and more vibrant." The 2017 Mayor's Enchanted Trolley Tour schedule is also available online.